Maruti Suzuki is set to launch the facelifted Ciaz C-Segment sedan in India next week. Media drives will commence next week, and the first impressions of the heavily revised car will soon be out. The leaks have begun in full earnest. The interiors of the facelifted Ciaz have now been fully revealed in the latest crop of uncamouflaged spyshots. The car gets a beige-and-black trim for the dashboard, with most other parts of the inside getting a beige theme. There’s a prominent faux wood insert across the dashboard, and this endows the interiors of the facelifted Ciaz with a touch a luxury. 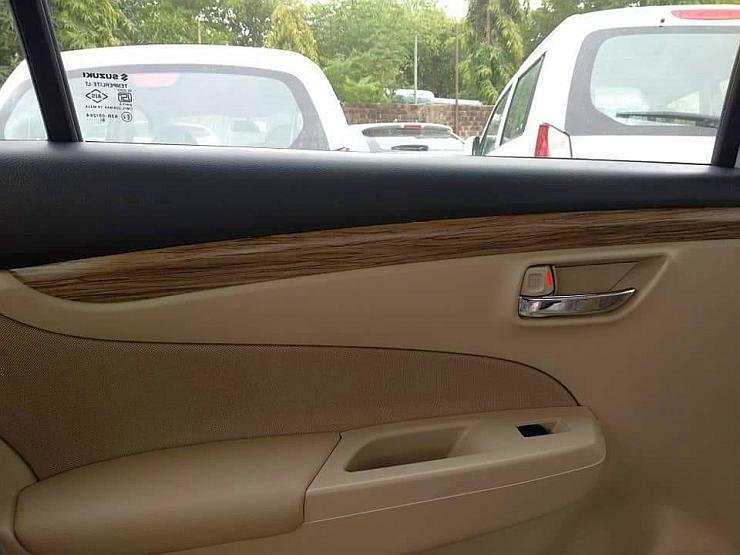 The faux wood treatment is also carried on to the doors of the car. In effect, Maruti has tried to give the Ciaz a look and feel similar to luxury cars and most buyers are certain to appreciate these small but significant premium touches. The car also gets a totally new instrument cluster, with ‘smart hybrid’ prominently emblazoned on the speedometer section. The facelifted Ciaz will be India’s first C-Segment sedan to go hybrid. 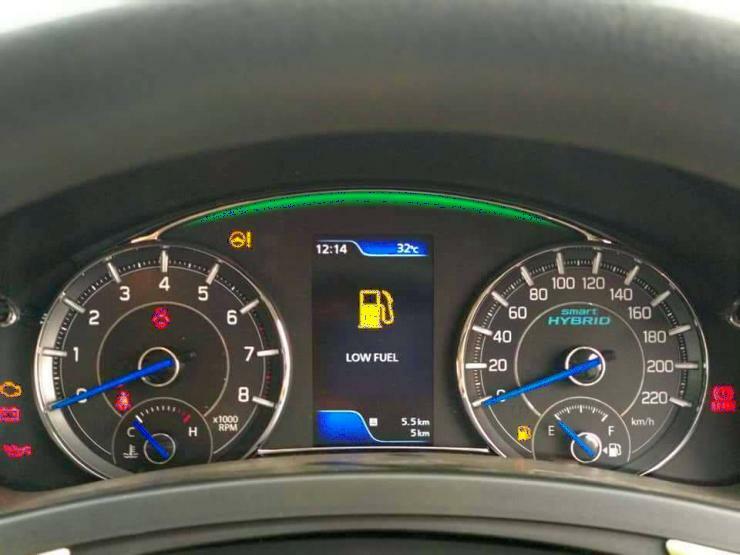 By hybrid, we mean partial/mild hybrid as the Suzuki Hybrid Vehicle System (SHVS) fitted to the car merely assists the engine during acceleration rather than functioning as a full hybrid. 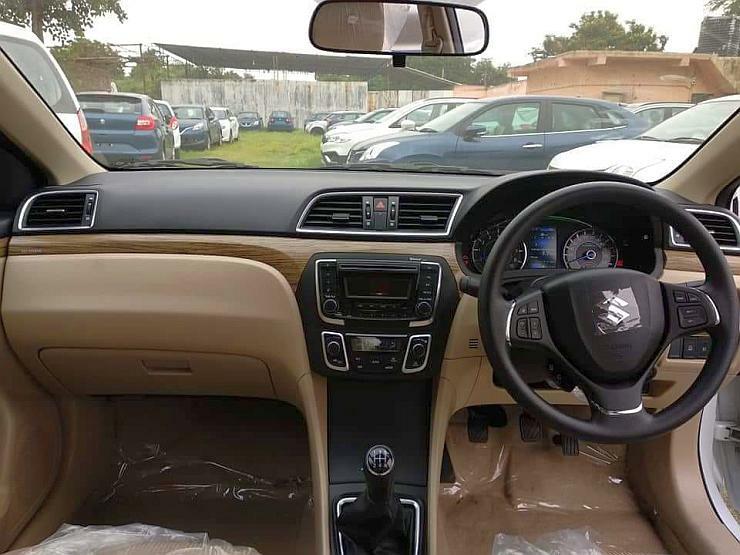 SHVS was already seen on the outgoing Ciaz’s diesel variant. In fact, the pre-facelift Ciaz was the first mass-market car in India to receive a mild hybrid system, and the same set-up is also found on the Maruti Ertiga Diesel. Even the facelifted Ciaz’s diesel variant is expected to get the mild-hybrid SHVS unit. Coming to the new petrol engine the Ciaz will use, it’ll get capacity, power and torque boosts. The 1.4-litre K-Series petrol engine is being replaced by the 1.5-litre unit, which now makes 104 Bhp-138 Nm. This engine will get 5-speed manual and 4-speed torque converter automatic gearbox options. The diesel engine will continue to be the 1.3-litre Fiat Multijet unit with 89 Bhp-200 Nm, and a 5-speed manual gearbox as standard.